They say there's a fine line between madness and genius. WCW didn't just straddle the line, they bound across it with gay abandon. Throughout the company's brief but eventful tenure, the disparity between acts of genius and acts of insanity was stark. Occasionally, the two overlapped; introducing Nitro opposite Raw was the prime example. The rest of the time, it was just plain insanity. Promoting a wrestler based on a rock band? Check. Hosting an event at a motorcycle rally with no paying spectators? Check. Putting the world title on an actor? Check. 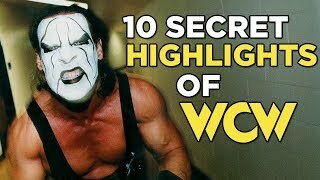 The truth is, the list of times WCW were the most insane company ever could extent almost infinitely. Here's just ten of the best. There have been many matches throughout wrestling history that make fans of the product hang their heads in shame, but this one really takes the biscuit. And not just any biscuit, but one of those giant cookies with all the chocolate chips on top. We're talking a big biscuit here. OK, first there's the participants. It's basically a disinterested Randy Savage and the babyface Hulk Hogan against most of the roster. As part of the evil 'Alliance to end Hulkamania', you had the workhorse Ric Flair and Arn Anderson (dressed like a ninja) as well as the Dungeon of Doom, comprised of such luminaries as The Barbarian and Lex Luger. For those who simply didn't get enough of Zeus at SummerSlam '89, this is the show for you, as Tom 'Tiny' Lister makes an unwelcome second appearance in wrestling. As an added bonus we also got Robert 'Jeep' Swenson of Batman and Robin's Bane fame! What were the rules of the match? Who knows! The wrestlers certainly didn't, nor the commentary team. Seemingly, the idea was to battle through the three layers of the cage with escape heralding victory, yet when Hogan and Savage exited the structure, instead of celebrating a win they headed to the ring for no apparent reason. Presumably, then, the objective was to gain a pinfall between the ropes. But it wasn't, and after an eternity of fannying about, the competitors returned to another ring at the base of the Doomsday Cage. Naturally, frying pans were soon involved (and distressingly, The Booty Man), before finally Flair was floored with a loaded glove by Lex Luger. Savage claimed the pin - but not before forgetting the rules and leaving the cage first. 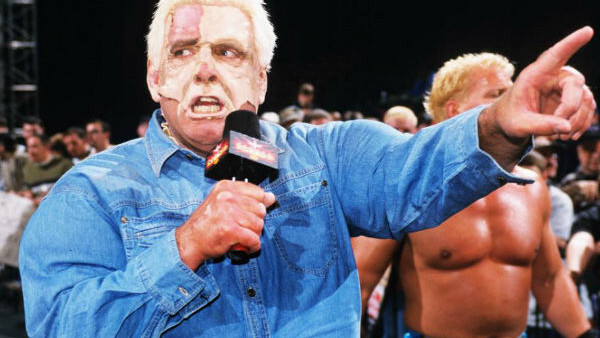 Yes, of all the men to do the job in this most drastic of matches, it was Ric Flair. Maybe he just wanted it over like the rest of us.